My friend Laina doesn’t buy torpedo shaped products any more. This is because one of them once fell on her foot, and her male housemates teased her about the phallic shape in the bathroom. I’ve decided I’ll also be giving them a wide berth from now on, but for different reasons. For me, none of these products delivered and despite hating waste, last night all three found a new home in the dustbin. 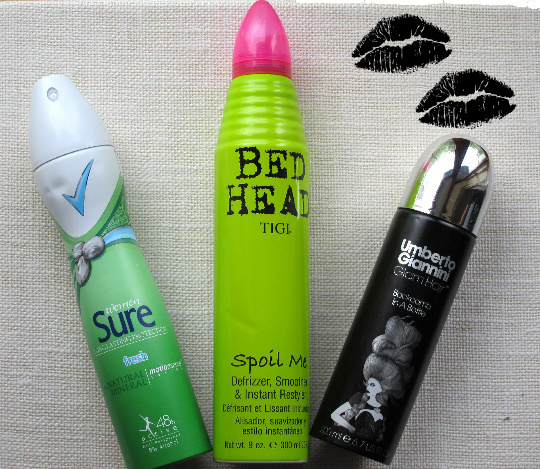 Sure Women Natural Minerals Fresh Antiperspirant Deodorant Spray: I stopped using this after 2 days of use because it left a white cakey residue that flaked off on my clothes. Not good. If you like the idea of this product I’d go for the roll-on variety. Tigi Bed Head Spoil Me Defrizzer Smoother and Instant Restyler: I wrote a full review of this here so I won’t go on except to say this product promised so, so much but for my hairtype, delivered so, so little. May work better on my finer haired sisters who perhaps don’t require quite so much defrizzing in the first place. Umberto Giannini Backcomb In A Bottle: The idea of a backcomb in a bottle sounded too good to be true. Funny, that. I’ve seen some good reviews for this product with people saying it works well in conjunction with backcombing your hair. I wanted it to do all the work for me and it didn’t, it just turned my roots into a sticky mess. I’ll be sticking to dry shampoo, OSiS mattifying powder or plain old hairspray from now on. I’m curious: have you tried a torpedo shaped product that you’d actually recommend? Em, I'm glad you feel my pain - but glad for you that you didn't feel my actual pain; those Umberto G bottles are heavy! Noted to steer clear of the rest though. I went to Asda, and being more of a spray, less of a roll on girl, i bought myself the lemongrass (past the sniff test - lovely!) dove bottle. Tornado shaped indeed. But brilliant. Its been muggy and nasty here today - and sunshiney and beautiful yesterday. I walked to work both days and half an hour later i still smelt fresh as a daisy! Works well, smells lovely, tornado shaped and well done you Mrs Fluff. oh yea, and thanks! *except when, like now, I blatantly do. Aw thanks Joanne, that's so nice of you to say! @Sarah, I can't wait to try out your own range! I love the Spoil Me and the Backcomb in a bottle! Just goes to show what works for one person doesn't always work for another!